Some time ago, Guy received a copy of the attached paper from a cousin in Peterborough, Ontario. It was written in 1976 by a young girl who grew up in Greenwich by the name of Beverly Sanderson. The paper gives an excellent account of the history of Greenwich. Guy told Bev he would transcribe it and send it to me to see if it was something I could put on the Register! The community I have chosen as my topic is Greenwich, PEI. I grew up in this community and was amazed to learn of the activities which were once carried on here. Greenwich is a very old community – dating back to the French settlement in the early 1700's. During the French regime on the island there were several prosperous settlements established along the banks of the rivers and bays. St. Peter's was one of these settlements. It was of great importance in the fishing industry and was considered the commercial capital of the island at this time. The French were settled around St. Peter's Harbour on the north coast of the island. The fish were very abundant here, especially cod. Also the land around the harbour was suitable for cultivation. Most settlers settled close to the banks of rivers because they traveled by water and also lived off the sea as well as the land. This is probably the reason why most of the farms in Greenwich are cleared along the shoreline. The entrance of St. Peter's Harbour is formed by sand dunes. In order to enter the harbour it is necessary to follow the lines of the sand dunes. These sand dunes are located at the point at the western part of Greenwich. The dunes affected the navigation into the harbour. The French believed that if an embankment were constructed from the foot of the sand dunes on the east side of the harbour to the border of the channel, and it was built high enough to force the currents to flow into and out of the harbour, then the currents would be diverted from the flat ground and become sufficiently rapid to clear away the sand bars. The fisherman from this settlement were obliged to acquire all their fishing equipment, supplies and food from the merchants of Louisbourg on Cape Breton Island. Due to the high prices they were forced to pay to the merchants and the low prices they received for their fish, they usually operated at a loss. 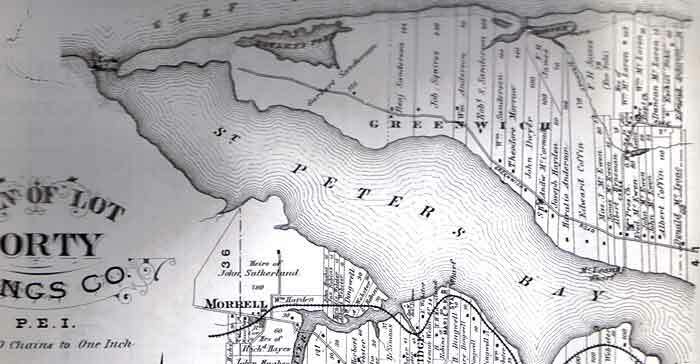 The settlers were scattered throughout the lands around St. Peter's Harbour. There were a considerable number settled on the land situated to the northeast of the harbour and along the north bank of the river in the area which is known today as Greenwich. Most of these settlers being both fishermen and farmers were settled along the banks. They cleared the land and grew mostly wheat, oats, peas and some rye and linseed. The French set up their farms and cleared the land in strips from the north bank of the harbour to the dunes on the north side. The farms today are still set up in this pattern. The French also raised livestock of all descriptions such as; oxen, cows, bulls, heifers, calves, horses, mares, ewes or withers, lambs, pigs, sows, geese, turkeys and fowls. The settlers lived in log houses which they built by themselves. Most of the settlers were native of l'Acadie or present day Nova Scotia and New Brunswick. Some of the names of the early French settlers in Greenwich were Jean Baptiste Vescot, Jean Oudy, Claude Oudy, Jacques Oudy, Jean LaCroix, Martin Tchipare and Guillaurne Gallet. These men and their families were living on the land with the verbal permission from Gouvernor M. de Pensens and Monsieur de Bonnaventure, the King's representatives. My father has told me that he remembers seeing the remains of the French church and fort. These buildings fell down and, not knowing their historical importance, were buried. I have also heard my father and neighbors talk about the French burial ground, now covered with sand and sandal grass. As described by my father, the burial ground was located to the north of the church consisting of sunken graves and flat headstones but today these graves are covered over completely and only a few hollows can be seen, but the stones are hidden by the swiftly moving sand. When the English invaded the island, the French took the bell from the church and fled to the opposite side of the harbour and buried the bell in Pete Sinnot's field at St. Peter's Harbour. In the 1950's the bell was uncovered and today hangs in the Catholic church in Rollo Bay. The French were the first to set up a settlement of any importance in Greenwich, although when the French arrived there were a few Indians there. The French civilized the Indians and the Indians helped the French settlers maintain themselves and shared their game with the French. During the early years of the French regime a great fire ran through a large part of the eastern section of the Island (from the settlement at East Point to the Hillsborough River). This fire did enormous damage. It burnt woods and destroyed the deer and other wild game in its course. Deer had been plentiful before this time. It is said that the fire was started by a spark from the pipe of an Indian. The French regime lasted for thirty-eight years till the capture of the Fortress at Louisbourg in 1758 and the consequent surrender of St. John's Island to the British. Samuel Holland was sent to survey the Island in 1764 to find out what the area was like and also to give the British government time to think about what they were going to do. Holland completed his survey in 1765. He divided the Island into three counties and sixty-seven lots. Greenwich is located in Lot 40. The original grantees of Lot 40 were George Spence and John Mill, both merchants, and George Burns, a Lieutenant. After the French there were no settlers in Greenwich till around the early 1800's when Charles Worrell took over as landowner of Lot 40. He brought over the first settlers from England and they settled at the western point of Greenwich. One of the first settlers, Captain Charles Sanderson, and his family farmed five hundred acres on this point in Greenwich. Worrell called his farm the Greenwich estate or farm after Greenwich, England. As more settlers moved over and this estate grew into a community it retained the name of Greenwich. Also the sand dunes at the west end of Greenwich are sometimes referred to as the Worrelling sandhills after Worrell and also because of the way the sand "whirls" around and shifts positions so rapidly. This farm, at least the greater part of the original farm, remained in the Sanderson family until the earl 1970's when the last owner, Cyril Sanderson, sold it. The farm was divided between Charles' two sons, Garbirt and George. Garbirt got 375 acres and George got the remaining 175 acres. Garbirt passed the farm on to his son, John, and John passed it to his son Cyril. It is interesting to learn how Garbirt got his name. While Captain Charles was living on the farm there was a shipwreck off the west point at Greenwich. The survivors saw the light at Charles' farm and came ashore. Charles' wife was expecting at the time and when their son was born, he was named Garbirt after the garboard of the ship. (a garboard is a board on the top of a boat). The rules about deeds were not as strict then as now, and often people were allowed to live on another person's land and did not need a deed. They were given permission by word of mouth. A man by the name of O'Keefe was living in the woods on Charles' farm. He was living by a large pond which later became known as Bowley's Pond. The Bowleys put O'Keefe off this land so O'Keefe cursed the Bowley family and the pond. He said that the pond would dry up and be of no value to the people anymore. The pond was very important because it contained a lot of wildlife and there was a lot of shooting done at the pond. Today the pond does not exist. The sand has moved in and filled in the pond. So maybe the curse did come true because the pond has dried up. According to the map of 1863 we can see that there were many settlers in Greenwich by this time. They had a church which was built in 1834 by the local men. This church is still standing but it is not used by the community. The last service held in the church was in January 1961. After this the Greenwich congregation joined with the congregation in St. Peter's. They also had a school in Greenwich. The first school was a log cabin which was built on the present land of the late Earl MacEwen next to the boundary of Preston MacEwen. The old log schoolhouse was bought by G. MacKenzie of Cable Head, who made it into a blacksmith shop. It was later sold and moved to the present estate of Robert Sutherland and used for a barn. They then built a new school which can be seen on the north side of the Greenwich Road on the map of 1863. Later, when the new road went through, it passed by the school on the north side as can be seen on the map of 1880. This school was then moved to the north side of the road to where it stands today. The school was closed in 1968 when the area was consolidated into St. Peter's. The old school building is presently owned and lived in by Benjamin Squires. The boundaries of this district were set up according to the school districts. Each district went a certain distance from the school. Most of the time the children had to walk to school. The districts were divided within about a two mile range from the school. This distance was considered walkable for the children. 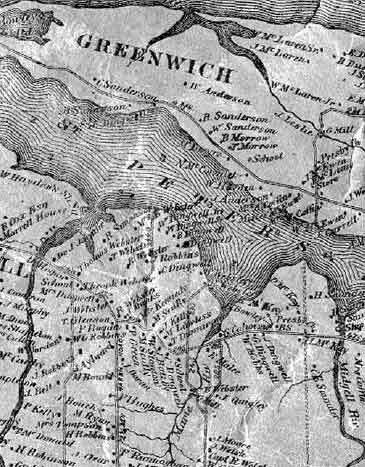 It is also believed that the community of Greenwich went this far up the road and stopped due to religious differences. Greenwich was a Protestant settlement and the eastern part of the road were primarily Catholics. The Catholics moved down the road as far as the farm of Shirley Sutherland and then stopped because from there down the people were Protestant. Neither group moved farther either way and from this farm to the west point was known as Greenwich. The setting up of school districts was the primary reason but religion also had a part in setting up the boundaries. They also had a gristmill (a mill for grinding grain). The miller was J. Leslie. As we can see from the map of 1863, many of the settlers settled close to the water. Just like the French, they still traveled by water and fishing was a primary industry. They also built ships here. The main shipbuilder was William Hayden. Travel by water was not as good as the people would have liked due to the sandbar at the mouth of St. Peter's Harbour. This bar made it unsafe for vessels to come in and go out. Vessels would not come in the fall so the farmers had to take their surplus produce to Grand River and some to Mount Stewart Bridge, a distance of about sixteen miles which was a long way by wagon or on foot. Again, the people had an idea of a breakwater (similar to the French) and they had hopes of a nearer market after the breakwater was completed. Most of the people paid rent to their proprietors. It is interesting to note that a few of the farmers had unusual leases of 999 years. Many of these leases were dropped but one was passed on down the generations to the present owner of the farm. This lease was first given to James MacEwen and it stated that as long as grass grew and water ran the farmer would have to pay twenty-three dollars rent per year. James MacEwen paid this rent to the owner at that time who was a Lord James. James MacEwen left the farm to his son, Newton. Newton then sold the farm to Robert Sutherland. The Sutherlands knew about this lease and they knew that according to its terms a descendant of Lord James could come and collect the rent. So each year they put the twenty-three dollars in the bank. A relative of Lord James, a girl who lives in the United States, came to see Mr. Sutherland about this lease, but decided she would not bother with it, so it was dropped. On the map of 1880 (see next page) we see there was a wharf in Greenwich called McLean's Wharf. The farmers shipped out their surplus produce (especially potatoes) from this wharf. The farmers would haul their produce to the wharf by horse and cart and ride onto the boats to dump their carts and then walk off. Today there is no evidence that the wharf ever existed. By this time they were still building ships here. wharf had been constructed so that the railway cars were level with the vessels when they came into the wharf. The mud was transferred from the vessels onto the railway cars and was sent to all parts of the Island. There was also an oyster bed located below the farm of Garbert Sanderson. Greenwich had its own post office in the late 1880's. The post office was located in the home of Albert Hyndman. Mail was delivered to the post office bi-weekly. Today there is no post office in Greenwich. Their post office is in St. Peter's. The original post office in Greenwich is now a deserted old house and is like too many of the old houses in Greenwich which are left to fall down. In the early 1900's Frank MacLaren operated sort of a store in his home. His stock consisted of necessities of the people such as tea, tobacco, rum, cotton goods, sugar and flour, for example. Even though this store was not very big it was more than there is in Greenwich today. The closest store today is in St. Peter's and even in this village there only exists one store. The original house of Mr. MacLaren was torn down a couple of years ago and the land is presently government owned and is rented by Junior MacSwain of Morell who uses it for agricultural purposes. Also in the early 1900's there was a small fish packing factory in Greenwich. It was located on the north shore of the farm that was last owned by Lambert Van Omme before he sold it and moved away. It consisted of the factory and a cook house. The local people referred to it as "Dawston City". This factory provided employment for many of the local people. Henry Rattary ran the factory and his brother, Ambrose, supervised the packing and sealing of the cans. They sealed the cans by hand soldering. The fish were landed here and then dried, pickled and packed. The different kinds of fish they did were salmon, lobster, cod and herring. There was usually a road which ran back of each farm with branch roads to the shore or to the factory. Nowadays, due to the lack of use, many of these roads are impassable due to the trees and bushes that have grown up over the years since the factory closed down. The first telephone in Greenwich was in 1912. At that time there were only three phones in Greenwich. Today, nearly every family has a phone and now they are on the dial system. During the late 1930's and early forties the people constructed a breakwater at the western part of Greenwich to prevent the sand from going into the harbour and making it unnavigable for large ships. This was not a new idea, as we have seen the idea of building a breakwater went as far back as the French in the mid 1700's. This project was sponsored by the government. The work was done by local people from Greenwich. There were also a few men from St. Peter's harbour who came across to work, also. Some of them swam their horses across the harbour to help haul lumber, stones and other material used in the construction. The breakwater was constructed of very long pieces of wood referred to as piles which were about twenty-five feet long. They were driven into the sand by a pile driver to a depth of about ten or twelve feet leaving about fifteen feet left above the sand. These piles were connected by railings and were filled in with mostly stones. This embankment stopped the sand for awhile but after some time the sand started to move through. So the people decided to construct a second breakwater. The second breakwater was built in the mid-fifties. It was similar in design to the first one but was filled in with not only stones but also trees and brush. Today both breakwaters are covered with sand. Again the sand is blowing out into the bar and again it is time to do something to stop the sand from going into the harbour. Also, the sand is moving rapidly onto the land moving in and covering the trees. Many of the farms in Greenwich were kept in the same family and passed down from one generation to the next. Today the majority of the farms are government owned and Greenwich is a designated Protected Area. Many of the young people have left Greenwich to seek employment and now the community consists of mostly older people. A considerable amount of farming is carried on but not to the extent it was years ago. As you drive down the road you will see many vacant houses. It is sad to see the way this community has gone from an age of prosperity kindled by small farms, a flour mill, a time of ship building, a canning factory, a wharf, its own school, church and post office, and today all these things are gone. The wildlife is not a plentiful now, although there are a few ponds, excellent in duck shooting. My grandfather has told me about when there were bears in Greenwich and how the bears used to kill the sheep. Today the wildlife consists of mostly smaller animals such as fox, raccoons, muskrat, mink and beaver. Because of these seasonal and permanent ponds and the large migrating populations of birds and the wandering sand dunes, the government is planning to make this area into a park. The heritage passed down from generation to generation is a priceless gift. Over the past years these honest, hard working people lived through times of hardship, sorrow and joy and are proud of their heritage and traditions that evolved through their hard work. Today these memories are being invaded by the fear of a national park coming into their area. If these plans are carried out there will surely be a great change in the people's patterns of living. Bolger, F.W.P. ; Canada's Smallest Province (a History of Prince Edward Island), (John Deyell Company, Canada, 1973). Campbell, Duncan; History of Prince Edward Island, (Bremner Brothers, Charlottetown, PEI, 1875. Special thanks to my parents, grandparents, Mrs. Hazel MacEwen, and to all the people from Greenwich who helped in one way or another through their contributions which have added so much to this history of their community. By listening to their stories from the past, I have learned to appreciate this small community so much more.